Your tenant has vacated the property and now you have 21 days to account for the security deposit. The law allows landlords to deduct portions of the security deposit to cover the cost of damages caused by a tenant. Landlords cannot deduct normal wear and tear of tenancy, or the expected depreciation of a property. E.g. If carpeting has been destroyed and it is 8 years old, perhaps no allowance is appropriate as the floor coverings were due for replacement. Similarly, destruction of a brand new carpet may result in full replacement cost to be deducted from the deposit. Normal wear and tear of a rental unit is the physical deterioration that occurs with normal use. Wear and tear generally excludes occupants’ or their guests’ negligence, carelessness, accident with, or abuse of the premises, fixtures, or chattel property. Normal wear and tear is deterioration or depreciation in value by ordinary and reasonable use. Signs of everyday wear and tear of a rental are worn electrical switches, frayed pull strings on blinds, lightly scuffed hardwood floors, loose caulking, peeling wallpaper, faded curtains, and dirty window screens. Time and regular daily use can cause any of these items to become worn, which does not constitute damage. When a tenant causes damage beyond normal use, a landlord has cause to charge the tenant for the damages. This may include damages inflicted by the tenants, their guests, or pets. Damage is usually caused by either intentional breakage and abuse or by negligence. Matted carpeting would be wear and tear, while burned or stained carpeting is clearly tenant damage. Similarly, a few small nail holes would be wear and tear, while large holes in the wall can be classified as damage. Fingerprints and faded paint would constitute wear and tear, while large stains on the wall, ripped wallpaper or broken molding would be considered damage. *The linoleum shows wear over years and must be replaced or the linoleum has stains and holes. *Cracks in the walls must be repaired. Is this due to the structure settling or the tenant’s carelessness. *Do you pick up a few left over toys and gardening tools in the backyard or do you need to haul loads of trash and debris. Remember that California State Law defines the reasonableness standard of tenant damages versus normal wear and tear of tenancy. A tenant who is unhappy with the disposition of his/her deposit will file a claim against the landlord in court. The landlord must be careful that delayed or neglected maintenance does not contribute to the damage. E g. The wall behind the door is missing a doorstop and now there is a hole in the wall where the doorknob caused damages. Leaking or dripping pipes can cause damage quickly and destroy cabinets and floors. Windows which are not securely shut can allow water from outside to damage woodwork and flooring as well. Any damages seen as the province of the landlord will certainly find disfavor with a judge. 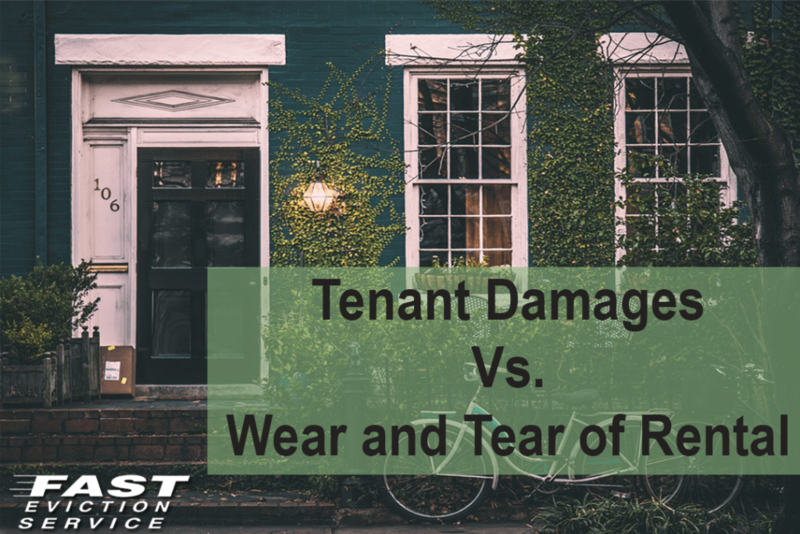 California State Law determines the reasonableness of wear and tear, which often depends on the tenants’ length of residency. For instance, if the tenants lived in the property for three years, it may be reasonable to expect to paint the walls and clean the carpets. If the tenants lived in the property for six years, it may be reasonable to expect to replace the carpeting. The property owner typically bears the costs for normal wear and tear maintenance. Many California Courts will allow you to prorate the useful life of a damaged item. Under California landlord-tenant guidelines, a carpet’s useful life is eight to 10 years. Then the cost of replacing the carpeting would have to be prorated over a 10-year period. The cost of replacing the carpet after 10 years is the responsibility of the landlord. If the court believes that the useful life of carpeting in a rental dwelling is five years, then the cost of replacing the carpeting would have to be prorated over a five-year period. You cannot charge the former tenant the full replacement amount if items are past or well into their life expectancy. Keep in mind that the security deposit belongs to the tenants, and you act as an escrow agent to hold and care for the tenants’ deposit. However, the funds may revert to you at the end of the tenancy if you make a successful claim against the deposit (in compliance with local and state laws) or the tenants have otherwise forfeited the deposit through violation. Common sense should guide you through the decision of what portion, if any, of the deposit is to be refunded and how much should be kept for tenant caused damages. Just remember to keep good records and receipts. The ultimate determination of the security deposit and how much any specific issue is tenant damage or normal wear and tear of the rental may be decided by a Judge in a California Court. Should I Let My Tenants Use Up The Security Deposit As Rent?